The current standard-of-care for millions of patients across the world with diabetic macular edema (DME) relies on invasive intravitreal injections or implants, both of which are associated with serious risks and side effects. An oral DME treatment could not only provide a less intrusive and safer choice but could also pave the way for prophylactic treatment. In addition to improving standard of care, an oral DME treatment would also remove the need for specially trained healthcare workers to administer eye injections, making treatment more widely available. An oral drug could also be used for prophylactic treatment to delay or prevent the onset of disease in a rapidly growing diabetic population, a market poorly served by current therapies. Verseon, a technology-based pharmaceutical company, has in development multiple novel, small-molecule inhibitors of plasma kallikrein for the treatment of DME. Plasma kallikrein is a central mediator in the kallikrein-kinin system (KKS), a validated pathway addressing an underlying cause of DME. These candidates show strong enzymatic potency, excellent selectivity, and are suitable for oral dosing. Select candidates have demonstrated efficacy in reducing two hallmarks of the disease, retinal thickening and retinal vascular permeability (or leakage), in preclinical models. VE-3539, a representative compound, is believed to be the first plasma kallikrein inhibitor reported to demonstrate oral efficacy in an industry-standard preclinical diabetes-induced retinal vascular permeability model. In diabetic patients, chronically high blood sugar can weaken the blood vessels in the eye, leading to fluid leakage (edema) in the retina. Over time, the fluid may accumulate in the macula, the central region of the retina, resulting in blurred vision, and eventually central vision loss. At present there are an estimated 21 million people worldwide living with DME (2010). If current trends continue, researchers estimate that about one in three US adults could be suffering from diabetes by 2050, leading to a sharp increase in the number of people affected by this condition. The most widely used therapies for DME are repurposed anticancer agents, such as bevacizumab (AvastinTM), ranibizumab (LucentisTM), and aflibercept (EyleaTM). All of these are injected intravitreally and inhibit the same target, vascular endothelial growth factor (VEGF), which is a key promoter of undesired blood vessel growth. Corticosteroids administered as intravitreal implants such as dexamethasone (OzurdexTM) or fluocinolone acetonide (IluvienTM) have also been approved for DME. All of the current therapies are associated with potentially serious side effects such as eye infection, eye inflammation, increased eye pressure, glaucoma, and retinal detachments. By targeting plasma kallikrein, a central mediator of the kallikrein-kinin cascade, Verseon’s drug candidates address an underlying cause and validated target of DME. The level and activity of plasma kallikrein are both known to be upregulated in the eyes of DME patients. Upregulation of plasma kallikrein results in the over activation of key inflammatory pathways and vasodilation in the retina, leading to edema and macular thickening. Verseon is looking to demonstrate efficacy in two industry-standard in vivo preclinical models: the first uses human plasma-kallikrein injection to induce retinal thickening and the second measures diabetes-induced retinal vascular permeability. In the first model, activated human plasma kallikrein (hPK) is injected to mimic the retinal thickening observed in DME patients. In the second model, retinal leakage mediated by a diabetic milieu induced by streptozotocin mimics the natural disease progression of DME patients over an extended period of time. This model determines chronic efficacy by measuring fluid leaking outside the blood vessels in the eye using fluorescein angiography. Two example images are shown in the figure. 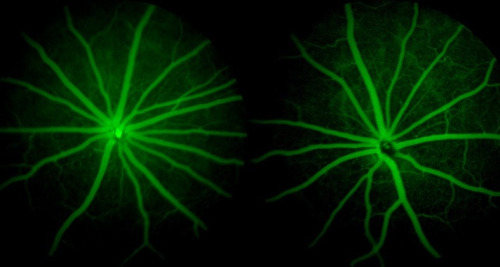 In the untreated image (left), areas of leakage appear as blurring between blood vessels and vascular margins. In contrast, once-a-day oral dosing of VE-3539 over a two-week treatment period, reduced leakage (right). Verseon is the first to report efficacy in this diabetes-induced retinal vascular permeability model for an orally dosed small-molecule plasma kallikrein inhibitor. The results demonstrate the ability of these candidates to reduce retinal leakage and slow disease progression. An oral treatment for DME could improve quality of life for millions of patients worldwide. Prophylaxis would be an important step in reducing the growth of incidence. Unlike current DME treatments which focus on the symptoms of already progressed disease, oral kallikrein inhibitors could address both prevention and treatment by attacking an underlying cause. Verseon is currently advancing a number of promising compounds and plans to nominate the first development candidate in 2018, followed by IND-enabling studies. These novel drugs are the result of Verseon’s computer driven drug design platform that pairs a proprietary, computational drug discovery platform with a comprehensive in-house chemistry and biology workflow to develop novel therapeutics that are unlikely to be found using conventional methods. The company has four active drug programs in the areas of anticoagulation, diabetic macular edema, hereditary angioedema, and oncology.